Billed as the biggest social reform since Medicare, the National Disability Insurance Scheme (NDIS) was launched five years ago with an ambitious agenda. A panel discussion held in Melbourne on Tuesday addressed questions from the public about how Australia is faring under the Scheme. Jointly presented by Scope and the University of Melbourne, the event brought together leading experts on disability to explore the topic: ‘Choice and control under the NDIS: Are we there yet?’. Contributing to the discussion was Prof Ron McCallum, a renowned legal expert from the University of Sydney who was the first totally blind person to be awarded professorship in Australia. Prof McCallum also chaired the UN Convention of Rights for People with Disability for a number of years. Joining Prof McCallum on the panel was Scope CEO Dr Jennifer Fitzgerald, University of Melbourne Prof Keith McVilly, Foundation Director of the Melbourne Social Equity Institute Prof Bernadette McSherry and Scope disability educator Brandon Tomlin. Dr Fitzgerald said that the panel format provided the audience with genuine, well-considered responses to a diverse range of questions about Australia’s NDIS journey so far. “As a leader in the sector, Scope seeks to create debate and discussion around some of the critical issues facing people with disability in Australia. We want to influence the implementation of good public policy and ensure that the voice of people with a disability is always at the centre of the conversation and that it is heard,” said Dr Fitzgerald. “The panel provided a platform to take these valuable discussions to the public, connecting disability sector experts, problem-solvers and thinkers with people in the community. Mr Tomlin engaged with the panel and the audience using Augmented Alternative Communication – using methods other than speech – to share his perspectives as a person with lived experience of disability. He closed the discussion by commenting on the importance of breaking down the barriers that exist as a result of societal attitudes toward disability in Australia. “If there were more training and awareness campaigns throughout Australia, we could transform the community’s attitudes toward people with disabilities,” said Mr Tomlin. 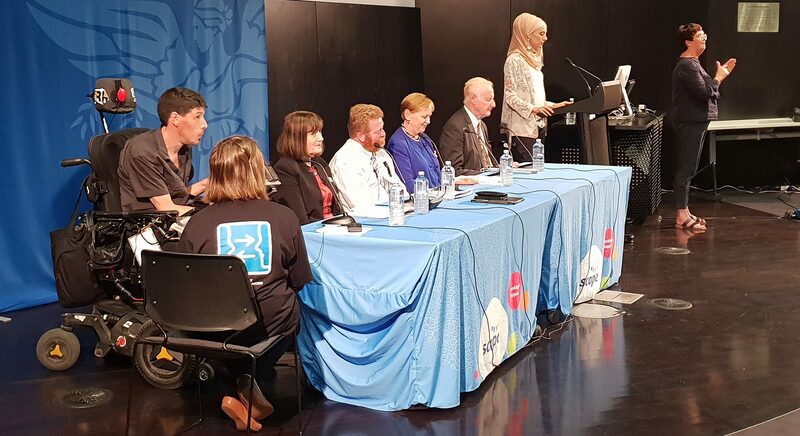 The event was held at the Melbourne Brain Centre and hosted by social commentator Dr Susan Carland. We support people with physical, intellectual and multiple disabilities and developmental delays to achieve their goals. Across Victoria, Scope provides services to over 6,000 people with a disability across more than 108 service locations.